Useful, targeted information, in a highly professional package - that's what you get with professionally printed booklets from Sprint Print. Booklets are ideal for price books, product brochures, training manuals, recipe books, daily work schedules, catalogs, and software manuals. 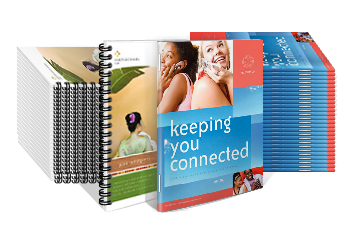 Bind your booklets with affordable comb or spiral binding, making it easy for your customers to flip through and find the information they need. Saddle stitching is also available.